An authentic Ragu Bolognese, like a comforting hug from an Italian nonna. So as the weather starts to cool off and the days get shorter, I feel it’s time for some comfort food. Something that makes me feel cosy, and Bolognese is just one such meal. 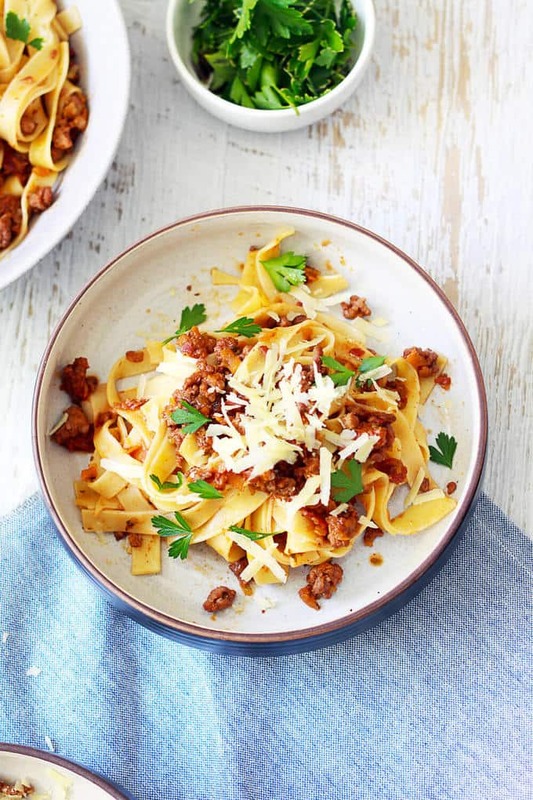 Let’s be honest, there are many such meals, but Bolognese is right up there at the top. 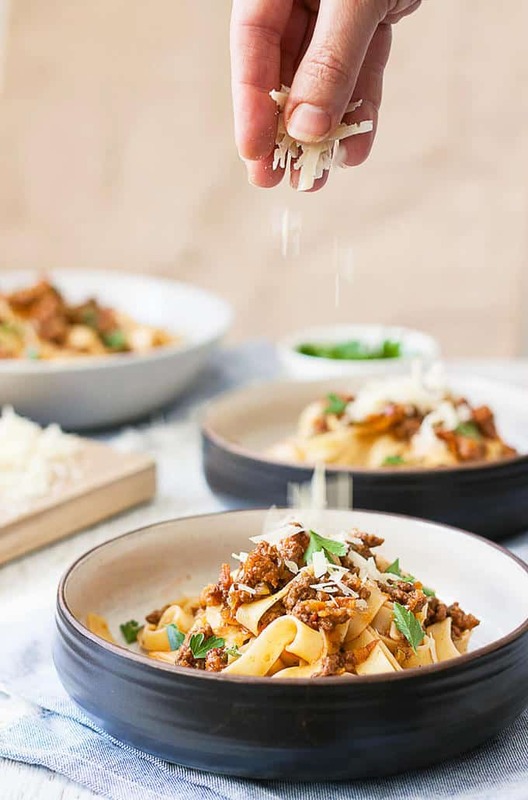 I’ve had my go-to recipe for Ragu Bolognese for a few years now. I’ve been making it for longer than that but it had gradually evolved into a really yummy Bolognese that I had not changed for a good few years. I’ll admit though that, even though I really enjoyed it, I felt like there was something missing. 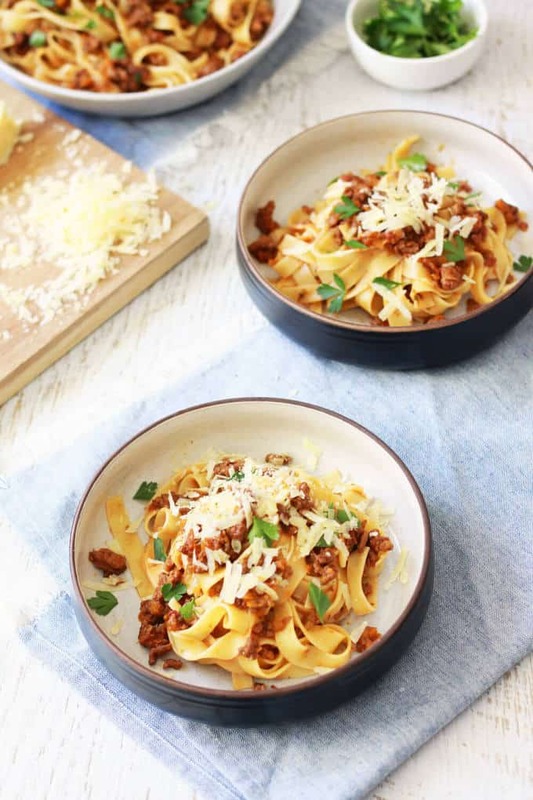 I just couldn’t get the same depth of flavour that you get from a really good Bolognese made in a good Italian restaurant, and nothing like the amazing flavour of a traditional Bolognese like what I tasted when we were in Italy on our honeymoon. Woe is me. Maybe it was just not meant to be. Thankfully I have worked out the answer to my conundrum and I owe it to Anna Del Conte. There was recently a show on TV called Nigella and Anna Del Conte. I watched intently as she began to make her Ragu Bolognese and as each ingredient went in, I actually felt a little bit of pride in how close to the mark I really was. Soffrito, that holy trinity of Italian cooking – my recipe has it. Red wine – yep, I do that. Cook for 1 ½ – 2 hours – yep, sure do. Somewhat happily, I realised my recipe has all the right ingredients, so what on earth am I missing? Turns out, I’m missing nothing. Absolutely nothing. In fact, quite the opposite. I’m adding too much. TINNED TOMATOES! Bingo! No tomatoes. You don’t add tomatoes to Bolognese. Who adds tinned tomatoes to bolognese? Ummmm, well, me. I tend to catch on a bit late as a general rule. I know lots of people will laugh at me and say, of course you don’t add tomatoes to Bolognese but, to me, it’s a revelation. I just always thought it should be in there. Well, I’m here to confirm, NO. it shouldn’t. So, I made it again, minus the tinned tomatoes and ta-daaaaa, it totally hits the mark. It’s AH-MAZE-ING!!! That’s why I’m now proud to share my Ragu Bolognese recipe with you today. 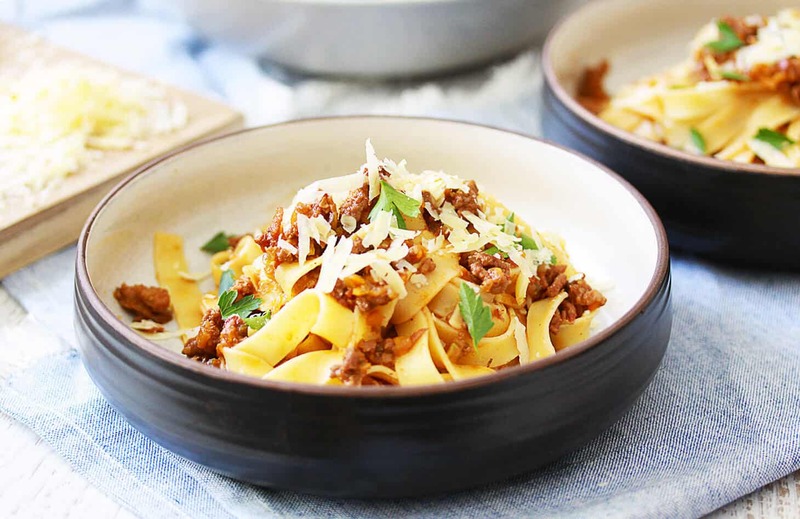 Finally, with a little help from Anna Del Conte, I have a bang on Bolognese recipe that I will never need to change again. 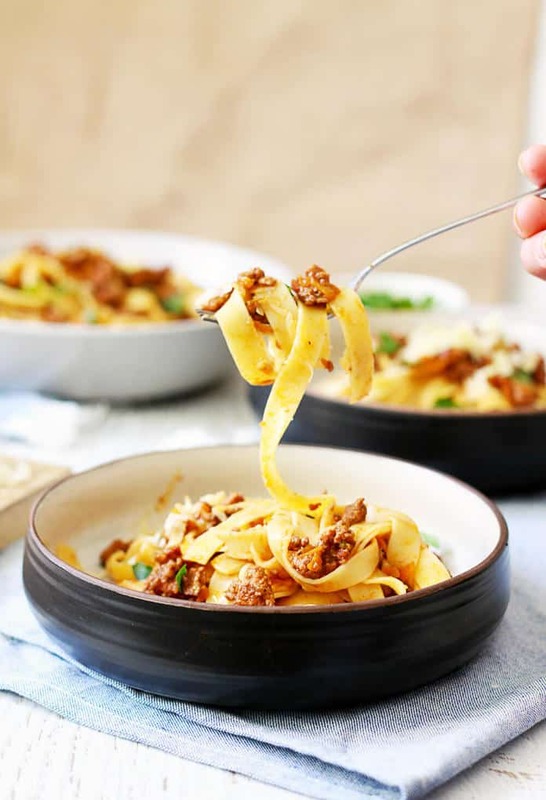 I use a few different quantities in mine and I add a touch of sugar (a trick from another geniune Italian person I know) and I use a pork and beef combination, while Anna adds a touch of nutmeg and sticks to just beef, but this Bolognese is everything a good Bolognese should be. Like a comforting hug from an Italian nonna. Thank you Anna Del Conte for getting my recipe back on track. Over the coming weeks, I’ll be adding some more delicious Italian recipes as I try to recreate delicious meals that we devoured while on our honeymoon last year. I’ll add the links below as I make them, but here’s a taste of what’s to come…. Heat oil in a very large heavy based pan, or dutch oven, over medium-high heat. Add garlic, onions, celery, and carrots. Sauté until soft, around 5 minutes. Add pancetta and saute for another 2-3 mintutes. Add the beef and pork, and cook stirring and breaking up with the back of a spoon, until browned, about 5-10 minutes. Add wine; boil for 1 minute, stirring often and scraping up browned bits. Add tomato paste and stir through, followed by the beef stock. Bring it all to a simmer. Reduce heat to very low and gently simmer, stirring occasionally for 1 1/2 - 2 hours. Check the seasoning towards the end and add more salt and pepper to taste if required. Bring a large pot of water to a boil. Season with salt; add pasta and cook, stirring occasionally, until 1 minute before al dente. Drain quickly, reserving ½ cup of the pasta water. Add the pasta straight to the ragu, and toss to coat. Stir in some of the reserved pasta water by tablespoonfuls if sauce seems dry. Divide pasta among warm plates. Sprinkle with grated parmesan. Make this ragu up to 2 days ahead. Once it has simmered for the 2 hours, allow it to cool in the fridge uncovered. Once completely cooled, cover and reheat in a pot when required. This ragu freezes well, for up to 3 months. Delicious!!! The whole family enjoyed! Have always added canned tomatoes or fresh (when frying the onion). Looks like I am going to have to get used to adding my lovely basil as well. This is going to take a little getting used to but I will give it a go. And how in heavens name did I get to 70 without knowing what soffrito was? Started googling like crazy and voila. Love the things I learn from your site Marie. PS should have said NOT adding my basil !